The Public Arts Board of Norman is seeking designs for Phase #5 of the Artist Designed Bike Racks Project. This fourth phase of the project will place artist designed bike racks across core Norman. We are looking for bike racks that can accommodate a minimum of two bicycles, one on each side of the rack (similar to traditional “U” shaped racks), and that will represent Norman’s unique aesthetic and cultural identity. And three to be placed on West Main at locations to be determined. Winning entries will receive a $200 honorarium. A Design Review Board composed of local arts advocates, bicycle advocates, and other community stakeholders will work with the Public Arts Board and be responsible for selecting the winning designs. No fabrication skills are necessary to enter this competition. The Public Arts Board will be responsible for the fabrication and installation of winning bike rack designs. Selected designs will be produced with the intention of replicating the design as closely as possible but the Public Arts Board reserves the right to modify the designs when it is necessary for fabrication. The competition is open to all Oklahoma artists. Only applications submitted through the online process will be considered. Applications must be 100% completed for consideration. • Design Worksheet: All designs must be submitted on the provided Design Worksheet. • Dimensions: The minimum and maximum dimensions are indicated on the design worksheet for your convenience. Bike racks must have a minimum dimension of 4’ x 3’ (h x w) and may not exceed 7’ x 4’ (h x w). FUNCTIONALITY GUIDELINES: It is important that the bike racks be functional as well as sculptural/aesthetic in nature. The Public Arts Board has partnered with local bicycle riders to provide the following guidelines regarding the functionality of the Artist Designed Bike Racks. Functionality will be an important criterion in selecting winning decisions. • Worksheet: For fabrication purposes, all designs must be submitted on the attached worksheet. Winning designs will be fabricated using the scale measurements on the worksheet. • White Background: In an effort to keep all of the designs consistent, we request that designs be submitted on a simple white background. No background images please. • Artist Information: Artist information must be filled in on each and every individual design. Designs submitted with incomplete artist information will be disqualified. • Content: Bike rack designs cannot directly advertise or advocate for any particular entity or organization (i.e. Walmart, University of Oklahoma, Zoos, Museums etc.). Also, winning designs must be appropriate for use in the public domain. • No “Wheel Benders”: In the bicycle community, bike racks that hold bike racks upright by the wheel are known as “wheel benders”. The bike racks that are used by bicyclists and bike advocates support bikes by their frame instead of the wheel. Designs that appear to encourage “wheel bending” type bike parking will be eliminated from this competition. • Materials and Line Widths: Bike racks will be fabricated using 1”, 2” and 3” diameter steel tube in both square and round stock. Artists may utilize up to 3 line widths to reflect these materials in their design. Artists may also suggest their tube stock preferences; square, round, or indicate a combination of square and round. • Hardscape Mounting: To insure that the racks can be securely mounted to the hardscape, designs must intersect with the ground plane in at least 2 points. For more information, please contact Norman Arts Council at nac@normanarts.org or by calling (405) 360-1162. Norman Arts Council announces the exhibition and three-month residency of Oklahoma cloudscape artist David Holland from May through July 2019 at MAINSITE Contemporary Art, 122 E. Main, Norman. Holland will set up his painting studio inside the gallery for viewers to observe his progress as he completes a five-foot by six-foot cloudscape painting from start to finish. Holland is known for his stunning high contrast oil portraits of active storm formations in the moments of their most visually breathtaking display. His residency — The Skies Have It— will be celebrated with an opening reception from 6 to 10 p.m. on Friday, May 10 at MAINSITE with a midway reception from 6 to 10 p.m. on Friday, June 14 and closing reception from 6 to 10 p.m. on Friday, July 12, all happening in conjunction with the 2nd Friday Norman Art Walk that takes place in the Walker Arts District of Downtown Norman each month. Erinn Gavaghan — executive director of Norman Arts Council — saw an opportunity to connect Holland’s visual study of clouds with the scientific community in Norman, whose “study of weather at the National Weather Center and OU’s School of Meteorology is unsurpassed,” Gavaghan said. Holland will lead a pair of workshops on both cloudscape photography and painting in late June to share the knowledge he has gained from more than ten years of painting clouds, as a part of Norman Arts Council’s Undercover Artists series. Holland with a work in progress for his exhibition and residency. But learning and observation is a daily aspect of Holland’s exhibition and residency. He will have an active studio set up inside the front of the gallery where passersby can see him painting live throughout the span of the residency. “I’m excited to share my methods and materials with people, so they can have the same joy in creating dramatic images I experience,” Holland said. MAINSITE Contemporary Art is open from 11 a.m. to 4 p.m. Tuesday through Saturday. The gallery and exhibition receptions are free and open to the public to attend. Visit mainsitecontemporaryart.com for more information. Norman Arts Council Invites Artists to Participate in Roaring Twenties Art Auction & Raffle! Artists are invited to participate in the Norman Arts Council's annual art auction and raffle! This is an invitational exhibit of works to support the Norman Arts Council. Deadline to participate is March 10, 2019. 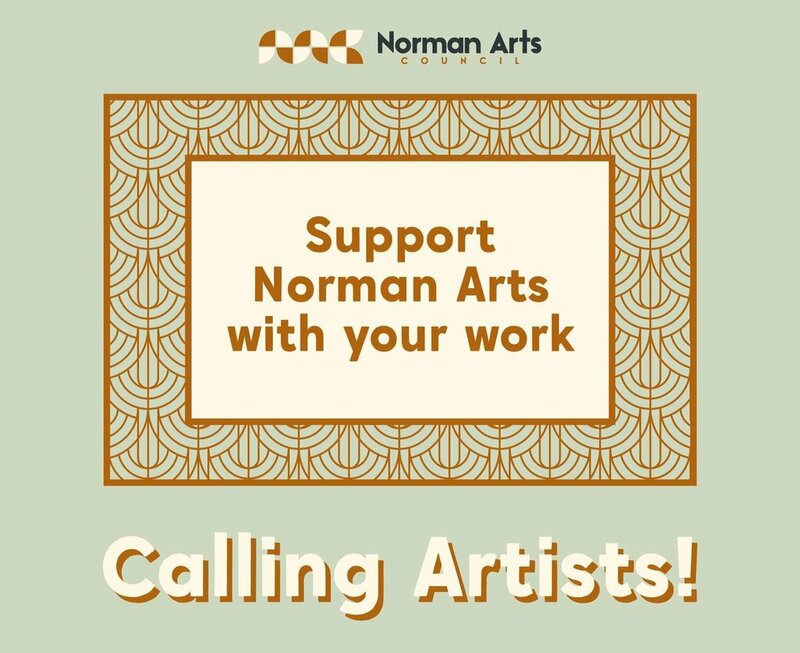 Artwork MUST be delivered to the Norman Arts Council the week of March 11, 2019 - No Exceptions! Artwork must be delivered ready to hang or display. Artwork must include Title, Artist, Medium, and Dimensions clearly marked on the back or bottom of the piece. Artists may choose to participate in either the Silent Auction or the Raffle. All work will be available for purchase through "Buy it Now" beginning the week of the event. Any work purchased prior to the event will still be exhibited at the event. Artists may choose to donate the work 100% or to split the sale of the work 50/50 with the NAC. NAC reserves the right to place donated works in either the Auction or the Raffle. The Roaring Twenties – a distinctly American period marked by the birth of Jazz, a new regionalist style of American visual art, Art Deco design, great American literature, the end of World War I, and the ratification of the 19th Amendment giving women the right to vote. Nearly 100 years later, we will be celebrating the period at this year’s most anticipated party of the year – the Norman Arts Council’s ONE event!! Lots of other arts party fun and surprises! SAVE $25 PER TICKET BY PURCHASING YOURS BY MARCH 23! Tickets will be available for $100 from March 1 until March 23, then $125 the week of and at the door! From now until March 29th, all of the art for ONE is available to view online AND to Buy it NOW! To inquire about purchasing art, contact Erinn Gavaghan at erinn@normanarts.org.